The Hunger Project (THP) is a global, strategic organization committed to the sustainable end of world hunger. THP Bangladesh was founded in 1991 to foment a volunteer-based movement for overcoming hunger and poverty sustainably. It is currently the largest volunteer-based organization in the country, with over 250,000 volunteers working toward self-reliance. In Africa, Asia and Latin America, The Hunger Project empowers millions of women and men to end their own hunger. THP has pioneered low-cost, bottom-up, gender-focused strategies in each region where hunger persists. These strategies mobilize clusters of rural villages to create and run their own programs that achieve lasting progress in health, education, nutrition and family income. 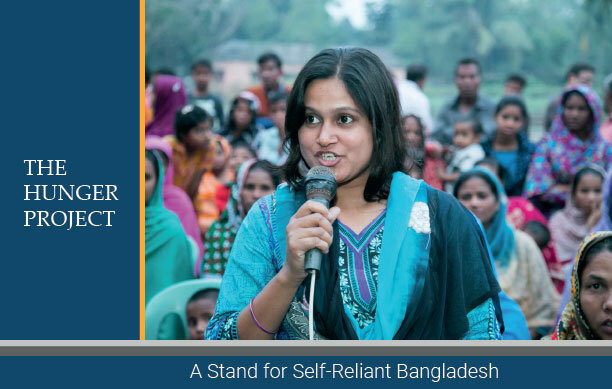 The Hunger Project-Bangladesh seeks a dynamic and experienced Bangladeshi citizen for the position of Deputy Country Director to direct the in-country senior management team and oversee all program. The position requires the ability to lead and oversee in-country program design, implementation and expansion, monitoring and evaluation of all programs under the guidance of the Country Director. The duties include staff management, organizational development, developing and maintaining relationships with key partners and senior government officials, community mobilization, preparing various programs and donor reports, and developing grant proposals for institutional fundraising. Travel to remote areas where THP works will be necessary. Develop networks and partnerships with national, regional and international institutions in Bangladesh and spearhead donor collaboration, fund raising and project development within the country. Excellent verbal and written communication skills in Bangla and English. Salary and other allowances are negotiable. Interested candidates should submit their resume, a writing sample and cover letter to The Hunger Project, Heraldic Heights, 2/2 Mirpur Road (Level-4), Block-A, Mohammadpur, Dhaka-1207 latest by 15th October 2018. Candidates who live abroad may apply to: swapan@thpbd.org Female candidates are strongly encouraged.